It’s pretty sad to see something that had so much promise be handled so poorly, a roller coaster of stress that did not have to be. This is the story of Sekai Project via the Root Double kickstarter - a story that, while ultimately in the big picture was a success, shows the glaring flaws of an entire process. A painstakingly difficult process, even when it probably shouldn’t have been. *Disclaimer*- I have received review copies from Sekai Project before, I funded the Root Double kickstarter and the people who made Root Double were involved with some of my favorite works, so I’m not entirely neutral on this issue, even though I tried to be as much as possible. 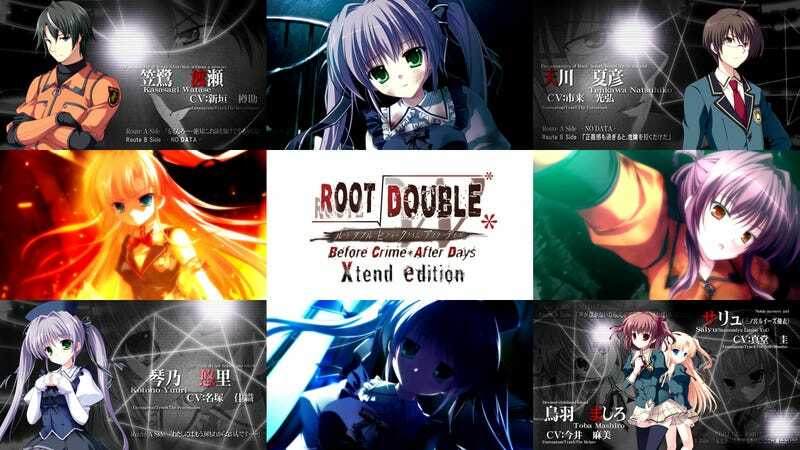 In July of 2015, during the convention known as Anime Expo, the visual novel publisher called Sekai Project a nnounced that a highly regarded but relatively obscure Sci-Fi visual novel called Root Double: Before Crime * After Days would be translated and localized for the english speaking world by Lemenscia Translations. To anyone who knows the people involved with this, one could not help but get excited. The game was helmed by the director of Ever 17 - The Out of Infinity, a much loved visual novel that is rather influential in the western visual novel community, and is also the spiritual predecessor of the Zero Escape series - visual novels that are proclaimed to be some of the best games of all time. The translation group, Lemnisca, is one that’s dedicated to translating science-fiction visual novels and its members have worked on works in the Infinity series, as well as the popular visual novel Steins;Gate. Everyone involved with the project brings excitement, except for the most important part of the puzzle: Sekai Project. Sekai Project is a really important part of the visual novel community, but its importance does not come without a cost. As I mentioned in my 2015’s Importance for Visual Novels in the West article, Sekai Project essentially took the western visual novel market that was nearly nonexistent and kickstarted it, but that was a big picture look at the situation; while they were a force that has greatly improved how VNs are considered in the west, it has not been smooth sailing for them. As time has past, it has been shown that even though they started it all and consistently bring over great visual novels, the way they do it, primarily though their kickstarters, has not been smooth at all. They have a really bad habit of putting out new kickstarters out constantly, to the dismay of many fans (which, unlike many people like to believe, probably isn’t detrimental to the progress of other VNs because Sekai Project since they have pretty much separate teams for every project). They have a fair amount of poorly advertised and managed kickstarters that either barely make it or fail, like Narcissu or their magical boy kickstarter respectively. They run into what seems to be a never ending amount of controversy or issues during the kickstarter even when the kickstarters are doing fine financially, like the Grisaia dakimakura and boxart issues. Even when their kickstarters have no problems, they’ve also had countless issues delivering what they promised to people: a few examples being any of the Vita versions they promised or whole kickstarters themselves, with the game World End Economica (which was written by the author of Spice & Wolf, for those interested) being the biggest sticking point to many. It’s been consistently delayed time and time again since it’s Kickstarter in mid-2014. (The last update told us they translated a whole 3% of the 3rd game that is left, and they got a new translator. Again.) Add this all up, and it tells you a message of failure - Sekai Project isn’t running their kickstarters that well, and have been constantly screwing up, while agitating and alienating people in the community. Their actions have pretty much guaranteed that you’ll probably come across a dose of hostility thrown around when talking about anything related to Sekai Project. Even Root Double, a game that has had almost unanimous praise, gets bashed just because it’s being published by Sekai Project, with people saying things like “Hope they fail, so SP learns to finish what they have before starting something else.” and “Such a scummy company. Dovac (The CEO of Sekai Project) is a sociopath.” While the statements are harsh and some may just attribute it to trolling, the worst part about this story is that they are completely justified, as Sekai Project has once again screwed up something that they have participated in. 1. They put up a Prefundia page during December, then for the whole month before the kickstarter came up, they proceeded to ignore nearly every suggestion and criticism for the kickstarter that was passed onto them. While this may seem minor, nearly every future issue about the kickstarter itself was mentioned here. They essentially let all of the problems with the kickstarter just stream into the actual KS itself when they could have dealt with them beforehand, like Degica did with the Muv-Luv Alternative controversy they had. 3. They failed to advertise or fix anyone’s issues until they realized that there was no way that this would make its goal unless it got a last-minute push, which they did by flooding the kickstarter with new tiers, new pricing, new rewards, a vita port, etc. 4. They put the kickstarter way too close to launch. It’s so close that many people (including myself) felt that it pretty much feels like a worthless endeavor because the game is coming out anyways. FYI, the game was already translated before the kickstarter rolled out - the kickstarter began in early January and the game is due for launch in March. Of this year. For a Visual Novel, The Root Double kickstarter is asking for a fair bit of money, $135,000 USD, to be exact. This number is even more daunting when you compare it to other Sekai Project kickstarters, which are probably the best ways to predict how this was going to go. They are asking essentially the same amount that they did for the rather popular Clannad which was $140,000, and is within striking distance of Grisaia’s $160,000 USD, a visual novel claimed to be one of the best out there and has a significant fanbase. The thing is though, there’s no way Root Double would have ever pulled the same amount of weight because those games have existing and rather large fanbases. They are the face of the genre, so of course they are going to do well! A small Sci-Fi VN isn’t going to be able to compete. So, how could they hit this number? When you look at the track record of Sekai Project’s kickstarters of works that do not have large, pre-existing fan bases, their kickstarters usually get around ~1,500 people, give or take a few hundred people. Given that number, this means that they expected an average of 90 dollars per person, but there was no way they’d hit that average without good upper tiers and early on their upper tiers were abysmal - it was one of the most common complaints of the kickstarter. Even though the kickstarter was updated many times, you can see the Prefundia page to look at what the kickstarter was like earlier on in the campaign and you can see how the tiers were a bad value. So even if people were interested in the product, the tiers didn’t justify contributing so much. The worst part was when Sekai Project essentially punched fans in the gut midway through - Many people were asking for a Vita version because many people interested in Root Double aren’t the people who traditionally hang around in the VN community and have Windows tablets. They’re the people in the Vita community who like JRPGs or story-based games (plus, people in the Vita community are looking for every possibility to play on it, so that is in the best interests of Sekai Project). When they announced the Vita tier, they limited it to 225 dollars or up. WHY WOULD YOU DO THAT??? With the updates at the end, spending more made much more sense, but that brings us to another issue: Why were they frantically updating it at the end in the first place? Why not just put the effort in preparing it at the beginning of the kickstarter and save all of this stress? I honestly don’t know, but if I had to make an educated guess, I’d say it’s Sekai Project not caring enough, acting like a failing student until they realize they aren’t going to pass the class so they rush to do as well as possible. There’s also another possibility, but this one isn’t nearly as pretty: the potential reason that they do these kickstarters. *Disclaimer* - The next part of the article is just speculation from the author. This is may or may not be the case, and we will never know unless they explicitly say it, but this is what I believe. Let’s head back to the 4th problem of the kickstarter for a moment - the fact that the kickstarter was released really close to launch. Why would they do this? If the game was already finished translating, why couldn’t you just release the game? I believe it’s due to the very nature of the visual novel community that they made popular. Sekai Project announces a lot of projects, and when you think about how niche this is genre is, one must wonder how they stay afloat, and how they manage to afford to keep publishing these visual novels. If an expensive visual novel fails, they would be in a world of trouble. I believe they ran this kickstarter not because they needed the money, but because they have little confidence that this game would recuperate the costs of publishing itself. When you look at the works kickstarted and the ones just published regularly, the ones that are published regularly are visual novels that are low risk. They are either small visual novels that were so cheap that budget wasn’t really an issue, or visual novels that have a large enough fanbase were probably cheap to licence and would easily recuperate their costs, with games like Planetarian and G-Senjou no Maou as examples. Given this, I believe that Sekai Project kickstarted Root Double because they want to balance their budget before they release the work, to guarantee that the game is profitable. Also, I’m not the only one who believes this - another blogger, the one who wrote the article on World End Economica I linked earlier, mentioned that “One of their staffers said they want to make sure to cover all their bases, thus avoid as much risk as possible.”, which is understandable, but isn’t that great of a deal for us. You may not think that this is a big deal, as they run a business, but this means that along with being incompetent at management, they are anti-consumer, their business model isn’t sustainable, as this means that they aren’t able to take hits in sales if something goes wrong. Also, this means they have major structural issues with the company that prevents them from running in a proper manner, and they are abusing Kickstarter, treating it as a glorified pre-ordering system. This is absolutely horrible to me as the sales should determine how a game should do, not a KS, and the fact they did a kickstarter in general isn’t the greatest of news for this one. They asked too much, they failed to advertise this well, the rewards are a joke, and it’s coming out anyways. There’s a laundry list of issues with Sekai Project and the Kickstarter make it hard to justify supporting things people love. I personally still backed the kickstarter, given that some of the people involved worked on some of my favorite works, but even through my fanboy glasses I can see the cracks and issues of a company that’s led the charge of visual novels through this kickstarter. From the surface, they seem perfectly fine, but the more you look in, the more deficiencies you see. You’re reading Rockmandash Reviews, a blog focused on everything revolving Visual Novels. If you want to read more of my writing, check out AniTAY and KMTech.